We want to introduce you to Lynn Everett McBride, executive director of Central Kansas Prison Ministry. He has been serving as the director since November 1991. Central Kansas Prison Ministry, Inc., is a non-profit group established to offer lay leadership and ministry to the inmates, their families and the staff at the various area Correctional Facilities. Central Kansas Prison Ministry works directly with many chaplains at area Correctional Facilities, as a liaison between the Christian community, the inmates and staff of the Kansas Department of Corrections. Central Kansas Prison Ministry works with the churches to organize the programs and then processes the "paper work" to see the programs implemented. The local ministry was formed after many months of planning, by a group of El Dorado residents who were interested in bringing friendship, evangelism and discipleship to the inmates, their families and Depart of Corrections staff. Larry Crawford, former CKPM president says, "Lynn comes fully qualified for director. 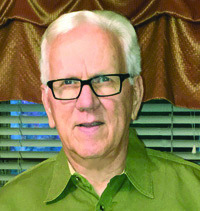 He has been affiliated with: Youth for Christ, local film coordinator with the Billy Graham Association, founder of El Dorado Gospel Concert Association, Regional Director of Evangelism in the Christian Motorcyclists Association, and businessman." Lynn, and his wife Karen, are natives of El Dorado, Kansas. He is trained in evangelism, computers, management, public relations, television, radio and print media. .